Crayola Multicultural Crayons are expressive crayon colors specially designed for hands-on learning about self, family, and community. Apricot, Burnt Sienna, Mahogany, Peach, Sepia, Tan, and Black and White for blending. Crayola Crayons are famous for rich, vibrant color. That's why Crayola is the name kids recognize in crayons. Standard crayons measure 3-5/8" long × 5/16" in diameter (80 mm × 8 mm). 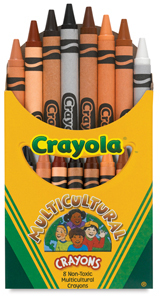 Crayola's large crayons measure 4" long × 7/16" diameter (100 mm × 11 mm). Sets are packaged in a tuck box.